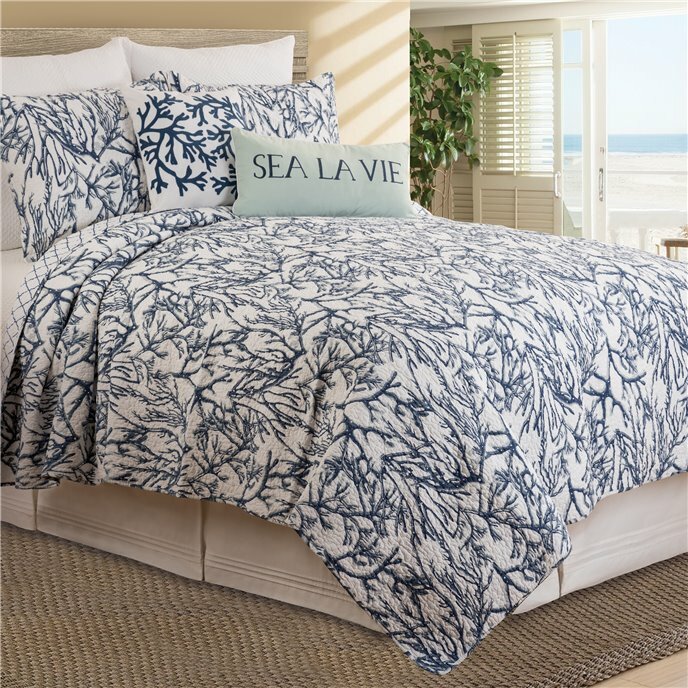 The Oceanaire bedding collection features a deep ocean blue coral pattern set atop a crisp white background. The quilt reverses to a nice blue and white lattice print, so you have plenty of options when styling your room. A simple white tailored beskirt completes the bed without distracting from the beautiful print of the quilt. Mix and match throw pillows and "Sea La Vie" with your own custom look! Made by C&F Enterprises. Give your coastal décor an upgrade with the Oceanaire Quilt Set. In a rich blue colorway, an allover coral print makes a stunning statement atop a white ground. Reverse to a blue on white lattice pattern for additional styling options. Crafted of cotton, this bedding set is machine washable for easy care. 1 Twin Quilt and 1 Standard Sham, Measurements: Quilt 64" x 86"; Sham 20" x 26" , Hand Guided Vermicelli Stitching, Coordinating Accent Pillows, Euro Shams and Bed Skirt Available Separately, Face 100% Cotton, Fill Material Polyester/Cotton Blend, Machine Wash Cold, Line Dry, Imported. Made by C&F Enterprises. Give your coastal décor an upgrade with the Oceanaire Quilt Set. In a rich blue colorway, an allover coral print makes a stunning statement atop a white ground. Reverse to a blue on white lattice pattern for additional styling options. Crafted of cotton, this bedding set is machine washable for easy care. 1 F/Q Quilt and 2 Standard Shams, Measurements: Quilt 90" x 92"; Sham 20" x 26" , Hand Guided Vermicelli Stitching, Coordinating Accent Pillows, Euro Shams and Bed Skirt Available Separately, Face 100% Cotton, Fill Material Polyester/Cotton Blend, Machine Wash Cold, Line Dry, Imported. Made by C&F Enterprises. Give your coastal décor an upgrade with the Oceanaire Quilt Set. In a rich blue colorway, an allover coral print makes a stunning statement atop a white ground. Reverse to a blue on white lattice pattern for additional styling options. Crafted of cotton, this bedding set is machine washable for easy care. 1 King Quilt and 2 King Shams, Measurements: Quilt 108" x 92"; Sham 20" x 36" , Hand Guided Vermicelli Stitching, Coordinating Accent Pillows, Euro Shams and Bed Skirt Available Separately, Face 100% Cotton, Fill Material Polyester/Cotton Blend, Machine Wash Cold, Line Dry, Imported. Made by C&F Enterprises. Versatile white basketweave quilted matelasse makes a beautiful bed alone or highlights many other ensembles. 26" x 26". Designed to be used behind a standard sham. We offer the complete ensemble in the Hampton Matelasse White line by C & F.
Embrace the Sea La Vie! A seaworthy lumbar throw pillow with embroidered text on a soothing blue background. Featuring a 100-percent cotton cover, coordinating piped edge and polyseter filling. Spot clean only. Measures 12" x 24", Coordinating Piped Edge, Filled and Finished in USA, 100% Cotton Cover, Fill Material Polyester, Spot Clean, Imported. Made by C&F Enterprises. A fabulous coastal touch for any room in your home. This coastal themed throw pillow features a tranquil coral embroidered in a delicate rice stitching. Crafted with a 100-percent cotton cover, secured with a zipper closure and a removable polyester insert . Spot cleaning recommended. Measures 18" x 18", Clean Knife Edge Finish, Filled and Finished in USA, 100% Cotton Cover, Fill Material Polyester, Spot Clean, Imported. Made by C&F Enterprises. The Oceanaire valance features a calming view under the ocean in blues on white. 15.5" x 72", including 1.5" header, 2.25" rod pocket. Exceptional value valance has a single layer of fabric. We offer the complete ensemble in the Oceanaire pattern by C & F.